This theme was thoroughly coded with SEO in mind. The basic HTML structure and the real estate microformat is just what the search engines are waiting for. This theme is fully responsive and optimized for a wide range of devices. It degrades on smaller screens and shows perfectly crisp on retina (high resolution) displays. The source code and the overall organization of the theme is clear and well-thought to make sure it stands strong but gets out of your way when you customize. The theme comes with two different home page templates. You create a static page and once the page template is applied, a set of meta boxes appears to create your personal, professional-looking home page in a few minutes. Apart from the standard widget areas like the sidebar and the footer the single listing page consists of multiple widget areas. Setting up the listing page is a breeze using the included widgets to display property information. 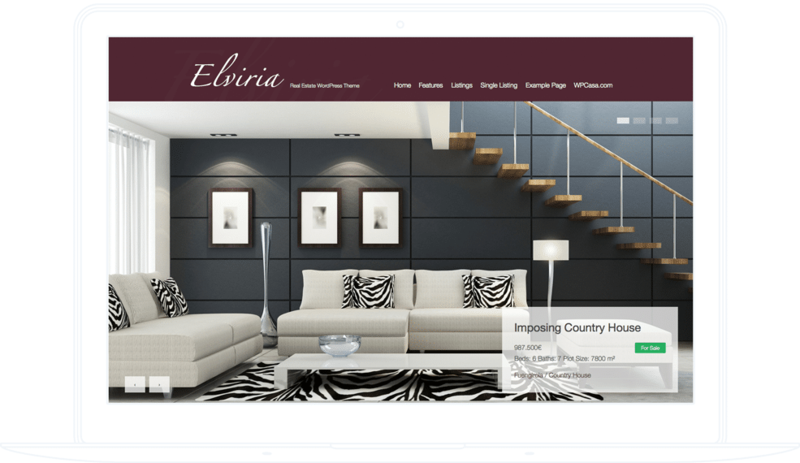 Using the WordPress theme customizer it is more than easy to change the main accent color of Elviria using the color picker. The color options are endless and can be set according to your corporate image with a single click. Adding an image gallery to a listing could not be easier. Just select or upload the files in the listing images meta box. Activate the gallery widget and a top-notch gallery with many options and a beatiful lightbox will be displayed. The theme comes with an image-based and professional-looking slider that ensures a great visual impact in a reduced space. Activate on the front page with a useful set of options for slider setttings and to filter the displayed listings etc. Another great feature to display a list of properties in any widget area is the listings carousel that is included in the theme. Similar to the slider widget you can set the carousel options and filter the displayed listings to your needs. The following add-ons are bundled with the Developer Package of this theme. Select the theme package that best fits your needs. Paid themes are subject to our license terms. Here are some details that might interest you before you proceed to purchase. What are layered Photoshop PSD files for? These files will come in handy if you're a Photoshopper. They are for people who prefer to draft their custom designs in Photoshop rather than directly changing the CSS of the theme. We will send you an email with a friendly reminder when it's almost time to renew. By clicking a link you can renew your license at a 30% discount. Will the theme still work after my license expires? Definitely yes. The renewal of your license after one year is optional. However, if you decide not to renew, you won't have access to updates and support for the corresponding theme. On how many domains can I use this theme? You can use it on an unlimited number of domains. However, automatic updates and support will only be provided for installations with a valid license. The included license can be used on 1 site. If you need a custom license, please contact us. On how many domains can I use the included add-ons? Just as the theme license you can use the add-on licenses on an unlimited number of domains. But automatic updates and support will only be provided for installations with a valid license key. The included license can be used on 1 site. If you need a one, please contact us. If you have more questions prior to purchase, please do not hesitate to contact us.